MIAMI — Justise Winslow has agreed to a $39 million, three-year extension with the Miami Heat. A person with direct knowledge of the agreement confirmed the terms to The Associated Press on Friday night. The person spoke on condition of anonymity because Winslow isn't signing the contract until this weekend. Later, Winslow confirmed that he would be signing the deal. "I'm just excited," Winslow said. "I'm invested in this team, in this city. It's nice to get it done before the season so I can just go out there and play, open mind, open heart. I'm committed to this team and committed to this city." Winslow averaged 7.5 points and 5.3 rebounds on 41 per cent shooting over his first three seasons, playing mostly as a reserve. He was the No. 10 pick in the 2015 draft out of Duke. The contract means the Heat salary commitments for the 2019-20 season, when Winslow's extension would begin, are about $135 million for 10 players. Winslow will make $13 million in each of the three seasons of the deal, though the Heat hold the third year at their option. "We just stayed steady, stayed the course and we got a deal done," Winslow said. ESPN first reported the sides reached an agreement. Winslow's 2017-18 season got a boost when the Heat swung a February trade to bring back Dwyane Wade to Miami. Winslow was averaging 6.8 points before the trade; he averaged 9.8 points after Wade returned. "Justise is ready to make another jump," Wade said earlier this preseason. "I think with him, the big thing is health. When he's healthy, he's a big part of this." 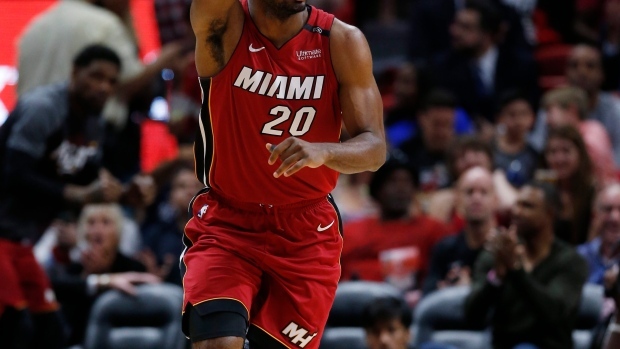 Winslow was held out of Miami's preseason finale against Atlanta on Friday night, with Heat coach Erik Spoelstra making the decision to give him rest. Miami opens the regular season at Orlando on Wednesday.